Noodler's Berning Red | Inkdependence! Ever since I saw the Noodler's video about this ink, I was hoping to try it out. And then the good folks at Pen Boutique offered to send me a bottle in exchange for my usual honest review. Well, here it is! I wasn't really expecting to like this ink all that much. I like Noodler's inks, and I like red inks, but I'm really hesitant about fast-dry inks. There are a couple of ways that fast-dry inks can be made. Their either soak in to the paper quickly or they evaporate from the paper quickly. Nathan says (in the video) that this does a bit of both. That worried me a little. Soaking-in inks are bleeders and feather-ers. Evaporating inks evaporate out of your pen and leave you with a crusty mess. Fortunately, this ink doesn't do much of those things. I haven't seen it evaporate out of the pen yet. It does bleed/feather/spread (as you'll see below), but it isn't nearly as bad as some of the other fast-dry inks that I've used. The other plus for this ink is that it is an awesome color. I had it in three very different nibs, and I graded a bunch of papers with it. 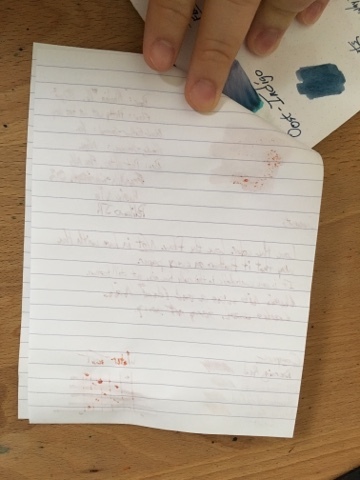 It bled through the student's low-quality paper, but I kept using it because the color was just so good. Check it out below and let me know if you think an awesome color and the fast-dry quality make up for the bleedy nature of this ink. It bleeds, but it doesn't bleed as badly as it might have. It's not too bad in the fine nib, though the music nib is predictable bleedy. Here's the back of the page of Rhodia that I wrote the review on. It kinda bled through the paper where I made that smear, and it tried hard to bleed through in a few other places. Discount the bit at the bottom where I did the water test, though, as that had water poured on it. Mostly, though, it didn't really bleed. It did feather some, oddly. So, if you're a lefty or you want a fast-dry ink and you don't mind a little bit of bleed and feather then this is a pretty cool ink. The color is great. It does dry quickly (as you saw in the video). Feel the Bern. Find it at Pen Boutique at $12.50 for a 90ml bottle. Super full. Be careful with this one, folks. My bottle was crazy-full.